Motherwell are up to a fantastic third place in the Scottish Premiership, a point above Rangers, after battling to a 1-0 victory at Dundee on Wednesday night. A much changed Motherwell side earned a deserved win thanks to Craig Tanner's early strike. The Steelmen, with Gael Bigirimana, Elliott Frear, Craig Tanner and Alex Fisher in their starting 11 in place of Chris Cadden, Allan Campbell, Andy Rose and Louis Moult, made a blistering start to the match in the City of Discovery. Tanner, one of the beneficiaries of gaffer Stephen Robinson resting players after the hugely exerting Betfred Cup semi-final win over Rangers on Sunday, shot home superbly after just five minutes following a Ryan Bowman head flick. And the summer signing from Reading almost scored his second of the night when his effort following a corner was cleared off the Dundee goal line. Speedy winger Frear then produced a fine run as the Steelmen continued to dominate, but his driven cross was cleared. 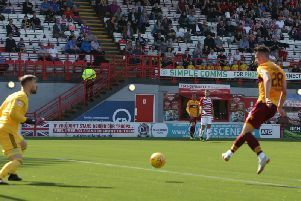 And Fisher - desperate to open his Motherwell goal account - had a low shot brilliantly turned round the post by Bain after a Tanner pass. A bizarre 34th minute incident then saw Dundee awarded an indirect free-kick within shooting range after Motherwell skipper Carl McHugh's shinned clearance found its way back to keeper Trevor Carson. Fortunately for the Steelmen, Dundee made a mess of the resultant setpiece. Motherwell defender Peter Hartley headed a chance over Bain's bar before Sofien Moussa shot straight at Carson in a rare Dark Blues foray at the other end. The second half wasn't quite as exciting as the first, although 'Well continued to receive good backing from their 404 fans in the 5254 crowd. The away side looked comfortable for most of the second period, when Moult, Cadden and Liam Grimshaw were introduced as substitutes, the latter coming on for Hartley who looked to sustain a knock. Bigirimana missed a great chance to put 'Well two up after 81 minutes when he shot weakly at Bain after a fantastic Moult backheel. Moult then had a free-kick deflected over the Dundee bar before a Haber header at the other end was easily saved by Carson. Moult shot over in injury time but the Steelmen comfortably earned another three points to make it an astonishing 13 wins from 17 competitive matches this season. Motherwell: Carson, Tait, Hartley (Grimshaw 66), Bigirimana, McHugh, Frear, Bowman (Cadden 52), Fisher, Dunne, Kipré, Tanner (Moult 60).